It's that time of year when deer are yarded up and surviving the harsh winter weather. I've been fortunate enough to see lots of healthy looking deer while walking through the woods. In talking with friends about the deer herd in their area, they have mentioned that they want to start feeding the deer to help them make it through the winter. I quickly respond with NO! Don't feed the deer! Biological Impact: Every animal has bacteria in their gut that helps to break down food. In the case of white-tails, the bacteria changes depending on the season and what their primary food source will be. In the spring, summer and early fall months, foods like grass, corn, apples, acorns etc. are easily processed to help the deer produce healthy fawns, rebuild weight lost after the winter and in the fall, help the deer put on weight to survive the long winter months. According to an article published on qdma.com (Quality Deer Management Association), "a healthy doe begins winter with a 90-day fat supply." Depending on the severity of the winter, that can easily get them into March or beyond. In the late fall and early winter, the bacteria in the gut changes to be able to process winter browse like parts of trees and plants. This change means that foods like corn and grain can not be processed as effectively as they could in the summer and fall months. According to Maine deer biologist Kyle Ravana, if deer are fed these foods, it ends up building up in their system and can go unprocessed. The deer feel hungry because they are not getting nourishment and energy from these foods simply because their body is not made to process these types of food in the winter but there is no room in their stomach for more food to fit. The result can be starvation. This article from Outside magazine does a great job of describing the impact winter feeding can have and the disastrous results it can play on the local deer herd. Disease: According to Ravana, diseases like Chronic Wasting Disease (CWD) and Epizootic Hemorrhagic Disease (Blue Tongue) spread quickly when deer are gathered into groups. Currently, neither of these devastating diseases are present in Maine. The closest CWD has gotten to Maine is New York. Both diseases are devastating to deer herds and can wipe out large numbers in a short period of time. Feeding deer and causing a higher than average number of deer to be grouped up, makes it easier for these types of diseases to get shared and then spread when the deer move out of their yards in the spring. What Maine does have is Lyme and when there is a high concentration of deer, there is also a higher probability of there being more Lyme cases. Easy kills: As deer are lured away from their natural yarding (and protection) areas with the promise of food, they put themselves at a greater danger of being killed by vehicles. Just this morning, my Dad reported that while out snowmobiling, he came across a guy who had hit a deer on his snowmobile. The deer had one, maybe two, broken legs but was not dead and would need to be shot. 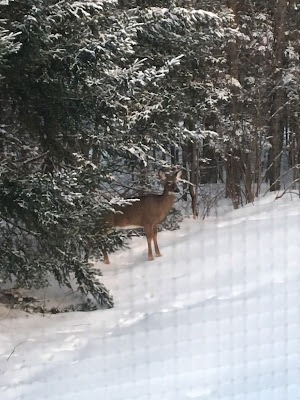 While these incidents do happen, when you feed deer and alter their normal behaviors, you end up with a higher concentration of deer making it easier for these accidents (between cars, snowmobiles etc.) to happen. Also, the more deer you can get into a small piece of woods, the easier you make it for predators like coyotes to get a quick meal. Deer and coyotes both learn quickly where their food is and for coyotes, knowing that they don't have to travel far to have their pick of deer saves them time and energy during the winter months when smaller animals like mice and rabbits may be harder to find. In areas of Maine where coyotes are impacting fawn recruitment, we don't want to help them any more than we already do. While we all love to see glimpses of wildlife near our homes, please do some research before feeding deer. 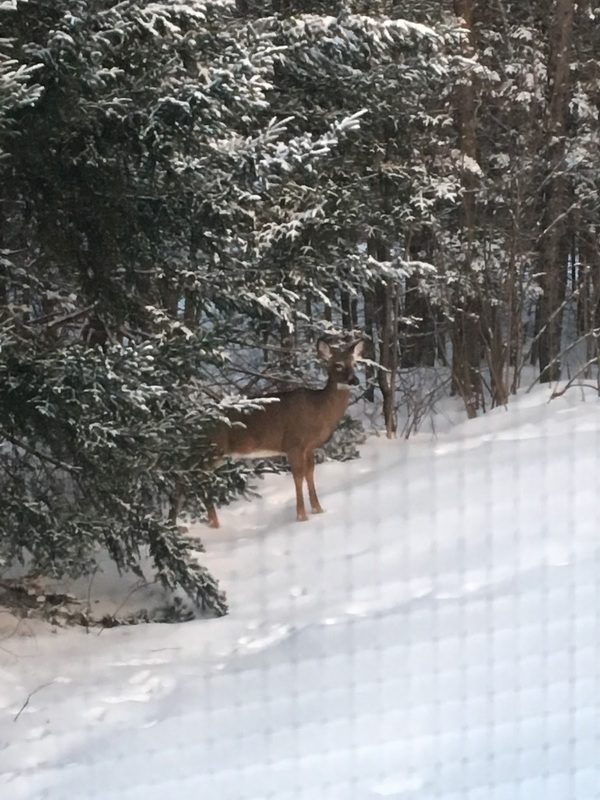 If you really want to help them out and own a woodlot or piece of woods, consider cutting down a tree or two to provide more winter browse and keep the deer on their normal winter diet. If we want to continue to see our deer herd grow and stay healthy, we need to be smart about the way in which we are helping them. My February column for Maine Woodlands is about this topic. We kept deer going the winter of 200"+ by felling cedar trees. Well meaning people in Princeton fed corn and killed a dozen deer. Sad situation.